Home »Concerts»Thomas Anders & Modern Talking Band in Boston! 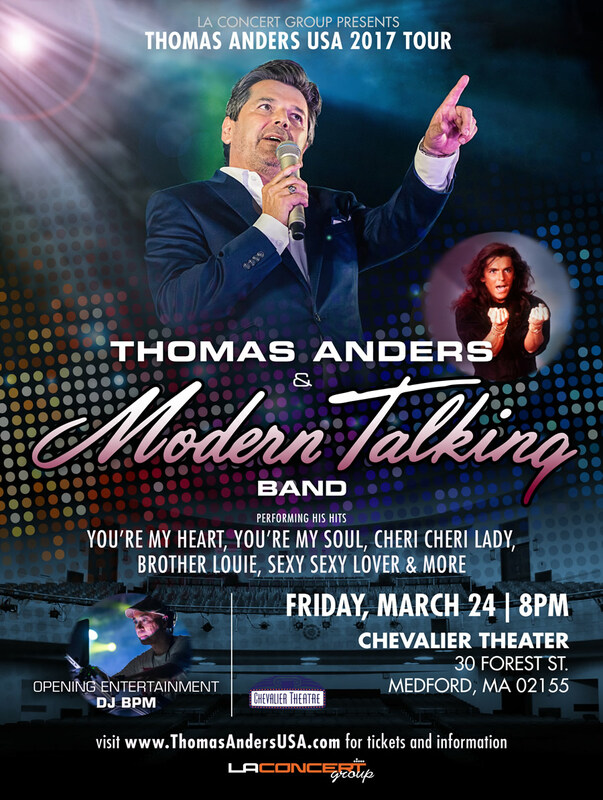 Thomas Anders & Modern Talking Band in Boston! Thomas Anders- the Legendary and magnetic voice of the iconic 80’s band Modern Talking, accompanied by Modern Talking Band – Live in Boston – Debut Concert! At the very intimate Chevalier Theater in Medford (suburb of Boston). Opening entertainment by DJ BPM. Seats are limited in this show- so grab your tickets soon! After sold-out & jam-packed shows in Los Angeles, San Jose, Chicago, NYC, Houston, we are pleased to bring this iconic band to Boston area! This is a live-music production concert, so get your friends and come on over to enjoy an amazing evening of 80’s nostalgia music. ← Previous Previous post: Thomas Anders & Modern Talking Band Seattle Debut! Next → Next post: Thomas Anders & Modern Talking Band in Washington DC!